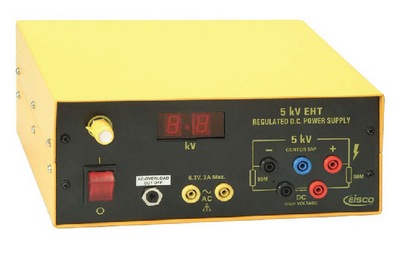 The E.H.T circuits on this digital power supply are fully floating, enabling the positive and negative terminals to be grounded for certain applications. The E.H.T. outputs are taken from 4 mm sockets and provide 100V to 5kV at 3mA or current limited to 60mA. A center tapped socket gives ±2.5kV output. An additional pair of 4 mm sockets at 19 mm spacing offer 6.3VAC at 2A for filament supplies. The power supply is hosed in a metal case and includes an illuminated on/off switch mounted on the rear panel.